Einars Graudins. Biography. | Interportal "Fascism-XXI at your door"
Home » Einars Graudins » Einars Graudins. Biography. Einars Graudins was born on November 22, 1965 in the city of Ogre, Latvian Soviet Socialist Republic. In 1984 graduated from High School in the village of Suntazi, Latvian SSR. 1984-1988: Studied in Yaroslavl Military Financial Academy named after General Khrulev (Rus: ЯВВФУ). 1988-1990 — city of Tartu, Estonian SSR, 43d the Order of the Red Banner Rifle Infantry Division, missile battalion. 1993-1996 - Airborne-reconnaissance battalion Defense Forces of the Republic of Latvia. 1996-1997 - senior officer of the Ministry of Defense of the Republic of Latvia. Awarded many state and public medals and honors. 2002-2010: Investments and business security consultant. 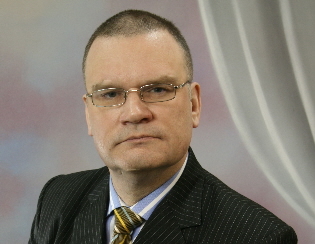 2008-2010 - Deputy Chairman of the political party «Demokrāti.lv». Political analyst, expert in military and political history. Published over 200 articles in Latvian press on the political, social and economic issues.